The art of pottery is believed to be therapeutic and relaxing. 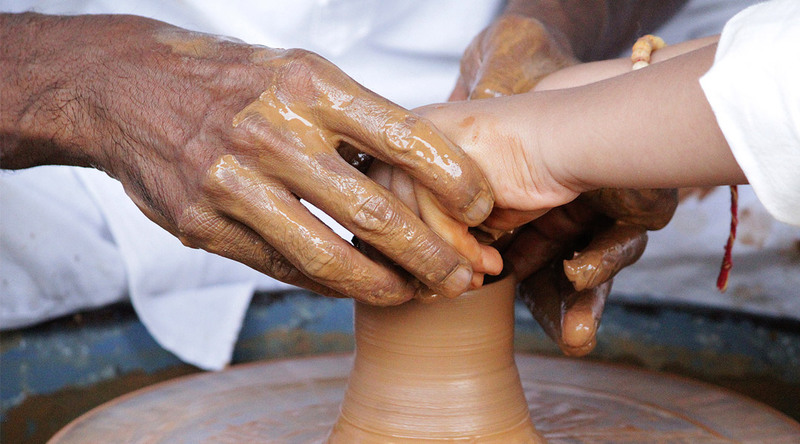 While spinning clay, your mind and body are in natural synergy, wrapped around your creative thoughts and emotions. Come to Vana for a healing experience with clay. Revive your connect with nature and explore your creativity while you create your own piece of art. Sanjay Gupta, an investment banker at New York city, turned to a self-taught potter and settled in Dehradun, will be in residence at Vana to take ‘Pottery and Ceramics’ sessions for interested Vanavasi from 15th May to 20th May and again from 2nd October to 7th October. Sanjay is well known for his hand-buffed terracotta work in addition to his organic ceramic artwork. His sculptures in wood and bronze are worth seeing. One of his greatest works is ‘Tapasvi Buddha’ statue at Bodhivana space of Vana. His artistic endeavours are spontaneous, intuitive, and in many ways quite basic, but liberating. He feels that pottery has not just taught him creative discipline but has also helped begun his spiritual journey. To book your retreat at Vana or to express interest in attending this retreat, please email Retreat Reservations at retreat@vana.co.in or call us on +91 135 3911114. You may also decide to attend these sessions after your arrival at Vana, however numbers for this retreat are limited!